Custom designed for your precious Fitbit Alta / Fitbit Alta HR Smart Fitness Tracker, this MoKo Noble Frame Housing + Milanese Loop Stainless Steel Fitbit Alta / Fitbit Alta HR Watch Band features a combination of functionality and style. Premium stainless steel material with solid wire mesh and magnetic Milanese loop, it is comfortable, eco-friendly and safe for the human skin. Suitable for all occassion. Fits 5.11"-7.87" (130mm-200mm) wrist. Adjustable design allow you adjust the bands length freely. * Made of stainless steel, this band is textured and durable. It is also water and sweat resistant. * Stainless steel mesh makes it a breathable band, allows air go through so that your wrist will not be always sweaty. * Thanks to the magnet closure, it is super easy to take on and off your Alta. You can also freely adjust the length to fit your wrist. * Beautiful color for your choice and can get variety color then change every day and fit your clothes. * Robust metal frame provide the maximum protection for your Fitbit Smart Fitness Tracker. Easy and direct installation and removal. * 18-Month warranty. Please search "Fitbit Alta Watch band" for other accessories offered by BSCstore. Flexible stainless steel mesh with adjustable Milanese Loop for comfortable day to day wear. Fits 5.11"-7.87" (130mm-200mm) wrist. 18-Month warranty. 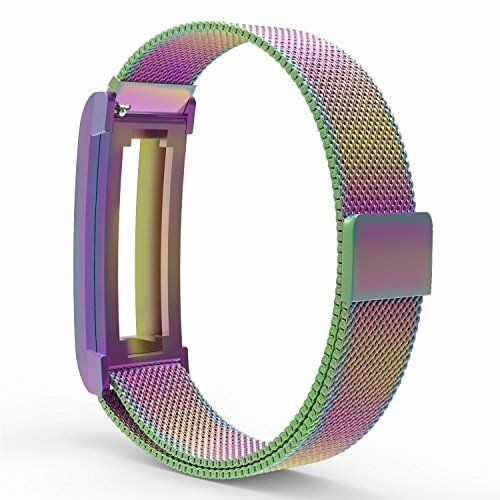 Custom designed for your precious Fitbit Alta / Fitbit Alta HR Smart Fitness Tracker, this MoKo Noble Frame Housing + Milanese Loop Stainless Steel Fitbit Watch Band features a combination of functionality and style. Tracker NOT inclued. Robust metal frame provide the maximum protection for your Fitbit Smart Fitness Tracker.